The mute swan is a large, all-white swan recognized by its orange bill which is black at its base. There is also a prominent black knob at the base of its bill. Another distinctive characteristic is the graceful curved neck held in an S-shape with the bill pointed downward while the bird is swimming. The male mute swan, or cob, is usually larger in size with a more prominent knob on his forehead but is otherwise identical to the female, or pen. Young swans, called cygnets, are usually white, but gray-colored cygnets are not uncommon. 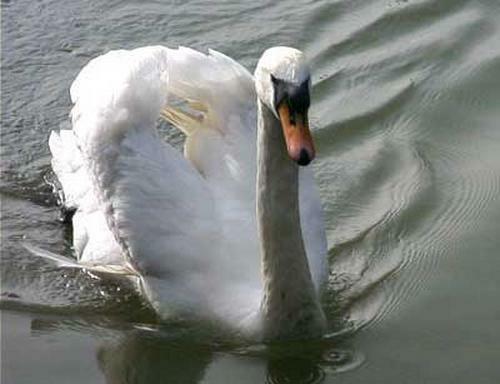 The Swans we ship to you are 1 year old and are not proven breeding pairs, because of their age. There is an excellent chance that the swan pair will breed at three years of age, although we can not guarantee this. Due to state regulations, Mute Swans cannot be shipped into the states of California, Maryland, New York or Michigan. Sold in male/female pairs. Pinioned. How do I specify (1) male (1) female, pinioned and do not have offspring? I am trying to order for a May 5th, 2018 birthday to Texas...is there availability? Additionally, what is the price? Our swans are sold as a male/female pair and always pinioned. I'm not 100% sure of what you mean when you said "do not have offspring". If you meant that they have not reproduced yet then you would want to order our yearlings they where are around 1 1/2 years old now. They start to breed at 3 years. We do have them available for the weeks of 4/23 & 4/30. Swans usually ship on Wed (can vary) and arrive Thurs or Fri. The yearling White Mute Swans are $2025.00 for the pair and shipping is $510. They are ship to the nearest airport and would need to be picked up there.